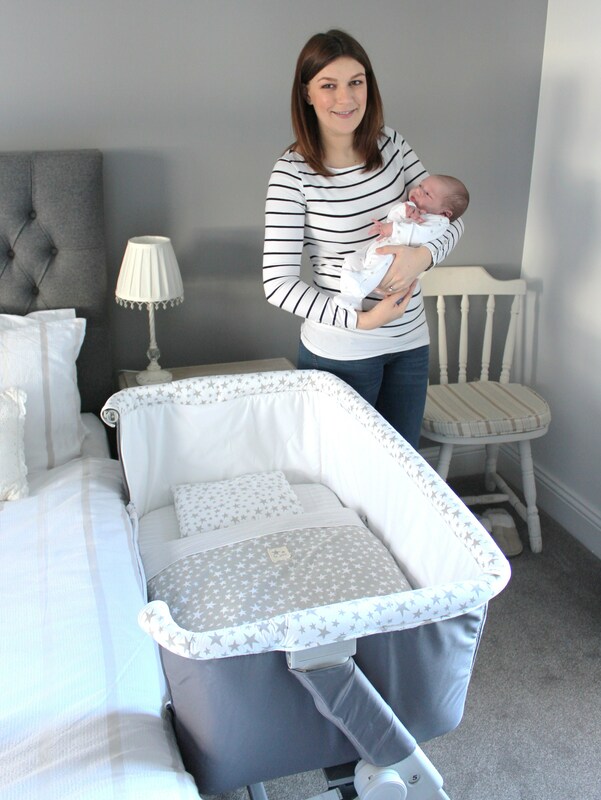 When buying the necessities for a new arrival there are a few ‘big ticket’ items on the list! A crib/moses basket and/or a cot are one of these. My sister had already moved Zac into his own room so offered us their Moses basket. My sister in law also offered us a crib, however I had been reading up on co-sleeping and the benefits of it using the Jané Babyside Crib and my parents had offered to help out so we decided to go ahead after researching the various versions available on the market. It helps newborns to adjust sleep-waking times. Makes it easier for mums to breastfeed. It is natural instinct for your baby to want to be close to you which is why skin to skin is so encouraged after birth and so it is only natural for both you and your baby to want to cuddle and be close at bedtime. I didn’t want Sam in bed with us, yet I loved the idea of him being so near so the Babyside met all of our needs. In the first week and a half I was breastfeeding and Sam was constantly cluster feeding so it was brilliant in that I just needed to sit up and he was there. I found that even though I was so tired I didn’t always sleep when he slept for fear he would have stopped breathing or something so having him so close by was reassuring. As I had a vaginal birth I was up and about (a bit slow for the first 24 hours) but I remember Kerry being pretty much confined to an armchair cluster feeding in the early weeks as she was not so mobile following her c-section. I can’t help but think now had she the room for the Babyside how much it would have helped her instead of reaching Zac in and out of the Moses basket each time. Kerry had used a traditional wicker Moses basket, it is beautiful to be fair (in my fav colours Grey & White!) but Kerry said there were some occasions when you would have just put Zac down and the wicker would creak and that would be him awake! We have the Moses basket in our living room and although it is good for naps during the day I am really glad we went with the Babyside. 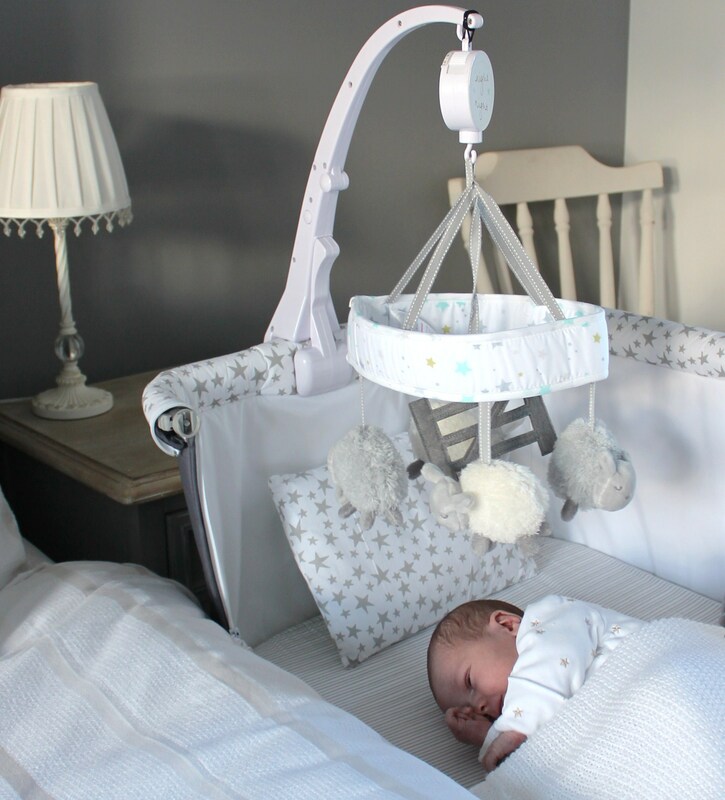 Not only does the side fold down so Sam can be as close to us as possible but it can also be a stand alone crib and travel cot too! If Sam stirs in the night I can stroke his back or if he is really unsettled give him a soother, fix his blankets etc all without much effort. You can also breastfeed lying down with the Babyside although I must confess I struggled and so the odd occasion I tried to breastfeed lying down Sam ended up in bed beside us. Don’t get me wrong we do get Sam into bed for a cuddle in the morning, especially at the weekend and try to enjoy him as much as possible but for their routine and overall safety the Babyside is such a good compromise between co sleeping and them being on their own. I know we still have to face moving him into his own room and eventually into a cot and bed but with the side being able to zip up we can begin to slowly move the Babyside away from our bed over time and eventually into Sam’s own room gradually. Once he does get up a bit there is the most gorgeous bedding set for the Babyside with a grey and white star design (To be honest the colour played a huge part in choosing this crib; it comes in 2 designs and colourways but this one will go perfectly with Sam’s nursery and it even goes with our bedroom – yes I am grey obsessed!). Currently though I am just using little sleeping bags or blankets as a pillow and duvet is a bit too dangerous for a baby only a month old. Zac road tested it below though!! At 7 months there is still plenty of room for Zac which is great as we should get plenty of use from the Babyside with Sam. We are heading to Donegal for a family break at Easter and as the Babyside is easily collapsible it will make the perfect travel cot. 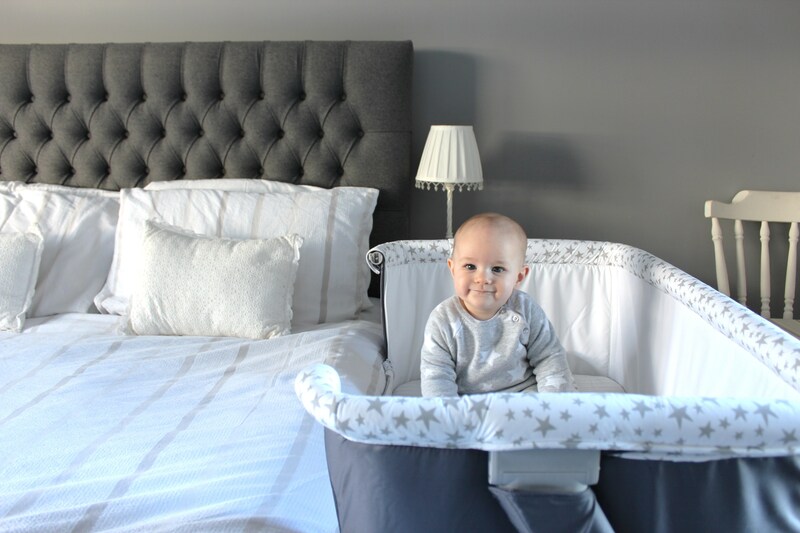 It fastens securely to all bed types and has 6 different height options (these can also be used to create an incline to help babies with colic/reflux problems!). If there is limited room in our accommodation I can also put the Babyside in the corner of the room with the side up! The only drawbacks I have found with the crib was getting sheets for it. I bought standard crib sheets in Asda but these did not fit so ended up buying some on Amazon, these are designed to fit the Jané Babyside and other bedside cribs on the market. They were cheap at only £14.99 for 2! Link HERE. The other thing, though totally cosmetic was my friend had bought Sam a gorgeous counting sheep musical mobile for his crib but this came with a screw on fastening which couldn’t attach to the Babyside. I went on to Amazon and found a solution, a clamp attachment, although it does hang slightly low. It will fit his cot once he moves into it later down the line. The Jané Babyside is expensive at an RRP of £225 but most stockist’s I checked have an introductory price of £199.99. I have found it a sound investment to help you get as much precious sleep as possible. I bought mine in my local stockist Samuel Johnston based in Belfast. @SISTERANDSONS1 Can you inform on where to buy the “counting sheep musical mobile” and also the amazon link to the “Clamp Attachment”. Thanks and much appreciated. 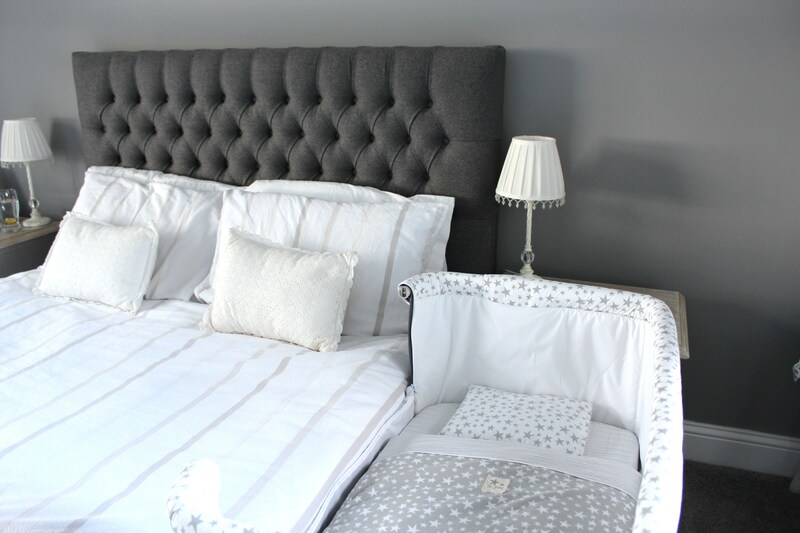 Hello, Really keen to use a side by side co sleeper crib but recently bought the highest king bed ever by accident and am now struggling to find a co-sleeper that is tall enough…….What is it’s tallest mattress height? The online information on other websites is so vague.